Are Fine Gael, Fianna Fail, Labour and pseudo-Independents set on destroying power-sharing in Donegal? Early last Monday morning as most of us woke up groggily and struggled out of bed to face the week, a dramatic closed-door meeting of the Independent Grouping within Donegal Council was taking place in Lifford at which the very future of politics in the county was being decided. Or at least that’s one interpretation: that pseudo-Independents (my sobriquet for them) backed by the Coalition Government partners of Fine Gael and Labour together with Fianna Fail were aiming for. But the political cat might be out of the bag, so to speak. (l to r) Let’s decide on a plan of action. 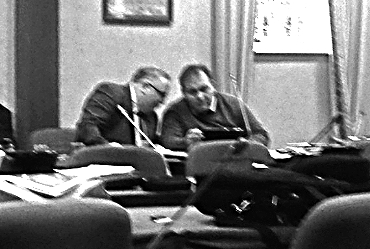 Councillors Frank McBrearty and Michael McBride confer discreetly at Monday morning’s meeting of Donegal County council. Could it be that someone poured (or was it self-administered?) poisonous elixir into the ears of certain councillors that the life of an independent within traditionally conservative Irish political circles is a short one, so they’d better rejoin the party fold again – before it is too late? “Being in a party makes for an easier life,” may have been the song on the hymn sheet. “You’ve got the company of like-minded people. Talk up the party you formerly belonged to until we win the Dail, then we – together with you – will control Lifford as well.” If it was, perhaps instead, without knowing, they’ve been listening to the Song of the Sirens. As Councillor Michael McBride told me last week, a motion by John Campbell at Monday morning’s private Independent Grouping meeting to have John O’Donnell expelled from the group supported, by Michael Cholm MacGiolla Easbuig and himself, was defeated by five other councillors, a strange situation to say the least as only last month, they had all voted to make him resign. But that wasn’t the biggest surprise of that morning. That came just a few minutes later, immediately Campbell and Easbuig left the Independent Grouping in protest. The five councillors in the Independent Group who voted against O’Donnell’s expulsion were Nicholas Crossan, Tom Conaghan, Niamh Kennedy, Ian McGarvey, and John O’Donnell himself, most former party members. Loosening his tie. But then again, Councillor McBride wasn’t wearing one, was he, at the council meeting? Just a bout of nervousness then? Or indecision? She added, “None of us are involved in the 25/30 councillors referred to by Cllr. O Donnell (on the RTE programme). This decision has been taken in the interest of the people of Donegal and in order to accommodate the smooth running of the business of Donegal county council following this past two months of turmoil.” But one is still left wondering why the Grouping was suddenly dissolved? Could it be, as McBride said, that they were fed up working with the fiery Frank McBrearty, who first proposed O’Donnell’s expulsion. Or with the intellectually able Campbell and passionate Easbuig? Or is something more sinister going down? Shakespeare: Is there something rotten in the state of …. Donegal? Why would the trio of Fianna Fail, Fine Gael and Labour want the Independent Grouping at Donegal County Council dissolved? Here is a possible answer. We’ll have a national elections very soon – we’ll know this week just when – and if the situation demands it, these three parties, regardless of what they say now, will try to ‘intermingle’ to form the next Government. But according to latest polls, their Donegal TD candidates desperately need all the help they can get even to shuffle lamely past the finish line – thus the pseudo-Independents. Fifteen years ago, the electoral breakdown was Fianna Fail a massive 70 per cent, Fine Gael 30 per cent, Sinn Fein 0.2 per cent and the rest Independents and Pseudos. Within the last five to six years, the Donegal political pendulum has swung dramatically and is now around 25 per cent Fianna Fail, Fine Gael 18 per cent, Sinn Fein a mighty 40 per cent, and rising, and the rest Independents and Pseudos. (r to l) Fianna Fail Donegal County Council chairperson, Ciaran Brogan, prepares for the meeting with council chief executive, Seamus Neely. And, let’s be quite clear about this: the main reason some pseudo-Independents are ‘Independents’ is that either their parties didn’t choose them to run last time out or that they’d never have won if they’d gone under that party’s ticket, especially if they’d gone under the Fianna Fail banner. In politics, however, such slights and inconveniences are often forgotten in the greedy grab for the prize piñata. What happened behind closed doors Monday morning one week ago after Campbell and Easbuig stood on principle and left could be a classic political quid pro quo situation. ‘Talk up the party in the nationals in a few weeks time and you can run under our ticket for a council spot next time round, and, believe me, you’ll feel more secure for doing so,” could have been the way it was put. Then again, my hunch might just be the workings of an over-active imagination. The truth might be that the Independent Grouping is a motley group, a raggle-taggle band with perhaps their hearts in the right places, but no cohesion. And so inexperienced and pulled apart by differences that they don’t even realize what their full potential could be if they created unity from diversity and voted for the right things. This, however, is the perfect time – with national elections six weeks away – to find out which of the above-mentioned theories is the right one. True colors will begin to seep through. Threads will start to unravel. If something more sinister is afoot, perpetrators of the cloak-and-dagger plotting have sadly overlooked one vital element – common decency. The overriding public mood is one of disillusionment, bordering on despair. If the three main political parties have indeed won the pseudo-Independents over – backed by business elites with much to gain by keeping O’Donnell on the council and on the ever-important ‘Roads’ committee which oversees tens of millions of euro in construction projects – trouble lies ahead. Keep in mind, the council’s annual budget is 133 million, 127 fixed and 6 to 7 discretionary. Construction of the Dungloe-Glenties road is in five-stages, the second, for example, cost around four million euro and the tender for the next stage is end of this month. 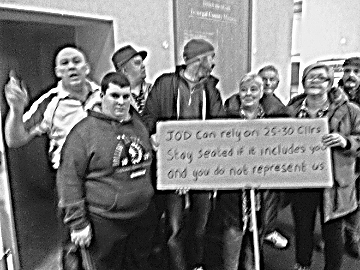 Protestors inside the County Chamber voice their sentiments about Councillor John O’Donnell, corruption and cronyism within and outside Donegal County Council. The ‘plotters’ may, however, have made the fatal mistake of ignoring the simple, unadorned hopes of ordinary folk, throughout Donegal and throughout the country, hopes for a sliver of common decency among politicians after all the putrid corruption they’ve been forced to roll in over the last five years or so. Another key question is now being asked in the corridors of power in Lifford: not if, but how many, high-level executives within Donegal Council – many of which were employed both within the county and imported from outside the county, with generous salaries and pensions under the previous, long-running Fianna Fail government – are involved in this purge of True Independents and the break-up of power-sharing? After all, they have to reward their paymasters. What a shame if such a deceitful game is being played, in this of all years – the centennial anniversary of our national independence. But in a very short time, you, dear Reader, will have the chance to put things right – by availing of your unalienable right to walk behind a curtain and put your ‘X’ exactly where you want it to be. Nonchalance or absolute certainty? John O’Donnell displays his lack of concern about the possibility he might be expelled from Donegal County Council on Monday morning. That very evening, he released a press statement thanking his fellow councillors for supporting him. 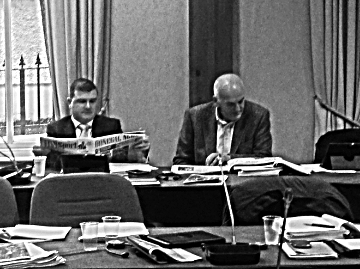 I was quite astounded watching the councillor last Monday morning nonchalantly reading that morning’s edition of the ‘Donegal News’ as the political maelstrom swirled all around him in the council chamber. Either this young man has nerves of steel, I thought, or he is so utterly sure of what will happen that there is absolutely no need for him to be concerned in any way, about anything or anyone. Wish I could wake up feeling that way, as I’m sure do thousands of unemployed, elderly, sick, disabled and struggling mothers trying desperately to feed their children on paltry, insufficient income coming into homes across this county, across the country. During a short adjournment, I approached O’Donnell and introduced myself as Gaeilge, thinking – as he had attracted so much Údarás funding – he would be fluent. Perhaps it was due to my poor pronunciation or stumbling vocal ways, but he didn’t seem to understand, so I changed my questioning to as Bearla. “What about the 120,000 euro granted to your company, Dúncrua Teoranta, by Údarás na Gaeltachta just before it went bust, can you explain that? “Will you pay the money back? Then he went back to reading his newspaper. O’Donnell, a long-time family member of Fianna Fail, also declined to comment on the court case he faces this Wednesday, Feb. 3 for failing to pay 33,000 euro in compensation to a Creeslough woman whose foot he drove over in a car accident. If O’Donnell does not show up for that case, District Court Judge Paul Kelly has said he will have him arrested. Next week’s court case should be just as entertaining as the county council meeting lastweek – with potentially very serious consequences for all concerned. If, having said he has no money, he pays up, you have to ask yourself: where did the spondulix come from? If his solicitor delays the proceedings, you’ve got to ask yourself: why? Could it be waiting for the results of the upcoming elections? If, however, he is convicted, I am ainformed O’Donnell automatically loses his council seat. There’s a lot at stake. Go along if you can. It should be as good as an episode of ‘Judge Judy,’ hopefully better – unless some shadowy person(s) gets to the judge before then.